Perhaps you have never been inside a church. Perhaps you have not been to church in a long time. Perhaps you have been attending another church. You just wonder what will happen and what will be expected of you when you walk through our doors. That is what this page if for. Our purpose is to honor and glorify God. Everything we do reflects that. So what has that to do with what happens when you walk through the door? Everything. Because how we treat you should reflect honorably on God. If you have questions we want to do our best to answer them. Feel free to ask, to question. Sometimes our answer may just be “Because we have always done it that way”. That may not be satisfying, but it will be the truth. But sometimes there are very good, Biblical reasons for what and how we do things. Feel free to just drop by the church office some morning and chat. Ask anyone, or corner one of the Elders or Deacons. You can even email the church at WestUnionChristianChurch@gmail.comWe will do our best to either answer your questions or pass them along to someone who can. Because if you have questions we want to help you find the answers. We want you to visit us at the Christian Church in West Union. We would feel blessed and honored if you would be our guest one day. We realize that visiting a church can be a puzzling process, and to make your visit more enjoyable, we would like to explain what you can expect when you honor us with a visit. When you enter the building , after an area to hang your coat and meet and greet people, you will enter what we refer to as the “auditorium”. There will be rows of pews for the worshipers. There are no reserved seats, so feel free to sit anywhere you choose. Our worship service may be a little different from what you are accustomed to. Please feel free to find your own level of participation. If you are comfortable in doing so, join right in. If not, that’s fine too. Our services usually do not begin in quiet meditation. What you hear is the joyful chatter of our family enjoying fellowship. Connecting with people is important to our church family, and we cherish every opportunity of coming together. You will notice that the whole congregation is our choir. In our assembly, music is something we all participate in, not just observe. We value the sincerity of praise much more than the perfection of performance. Feel free to lift your voice to the Lord with us. We may use hymnbooks, words projected on the screen in the front of the auditorium, live music of several styles, or pre-recorded music. We do not feel worship is bound to one style or format. There will be several prayers during the service. They may be prayers for specific needs and or requests. You will notice that our prayers are not from prayer books, but from hearts that know the Lord. They are sincere conversations with our Father in heaven. If you visit on a Sunday, the Lord’s Supper will be included in the worship proceedings because we observe this memorial every Sunday, as was the example of the first century church which celebrated this observance on the first day of the week. (Acts 20:7) The emblems, the unleavened bread and the cup, remind us of the central facts of the Christian faith – the death, burial, and resurrection of our Lord and savior, Jesus the Christ. Sharing the Lord’s Supper together is an expression of oneness with the Lord and each other. During this memorial, plates containing pieces of unleavened bread will be passed throughout the congregation. The bread symbolizes the body of Jesus. (1Corinthians 11:23-25) Each participating person will take a piece of the bread and hold it. We will eat it together at the same time (in unison). Next, trays filled with small cups containing “fruit of the vine”, grape juice, symbolizing the blood of Jesus. (1Corinthians 11:23-25) will be passed. Each participant will take a cup and hold it until we drink it in unison. The trays will then be passed again to collect the cups. Participation is open to all who accept Jesus as their Lord and Savior, regardless of local church affiliation. If you choose not to participate, don’t be embarrassed. Feel free to just pass the plate or tray to the person next to you. As our guest, you are not expected to make a donation or offering. Please do not feel obligated to give. The sermon will likely be from 20 to 30 minutes. We think you will find it refreshingly Bible-centered. The sermon will reflect the fact that we believe the Bible is God’s inspired Word. It will be a practical message from the scriptures intended to be applied to daily life. Follow along in your Bible or take notes if you like. By all means, feel free to ask any questions after the service. Our interest is in discovering and applying Biblical truth to our lives. Most sermons call for some kind of response. This is known as the “Invitation.” At the close of the sermon, the preacher will “extend an invitation”. This is simply an expedient time to invite those who are moved to do so to make a commitment, re-dedication or a request prayer. Don’t feel ill-at-ease during this invitation. You will not be singled out in any way. There may be several who respond to the invitation or none at all. Usually the response will simply be between the hearer and God. 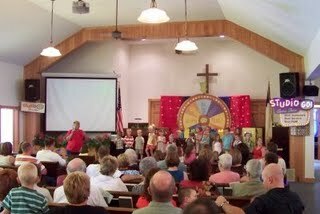 We traditionally stand and sing an “Invitation Song” at the close of the sermon to facilitate those who want to make a public response according to their various and individual needs. Some may respond for baptism, some to confess sins, some to ask for prayer for a specific need, and some to “identify” or “place membership” with this congregation. What ever the need, anyone is welcome to respond. Nothing at all! We do ask you be respectful of others. You are welcome to participate. But, please don’t feel obligated to do so if you don’t feel comfortable. Just observe if that is your choice. What kind of people can you expect to find? You will find happy people and grouchy people; Friendly people and unfriendly people; Loving people and cantankerous people; People who are learning and people who think they already know everything. We’re a diverse group, coming from varied backgrounds, and at different stages of knowledge and spiritual growth. We don’t know everything. We don’t do everything right. We don’t always treat each other as we should. We haven’t arrived – we’re just on the journey. That’s the reason we can worship together, stick together, and, with God’s help, accomplish some things that make a difference. Bottom line, you will find people who love Jesus and love the Bible. Authorship: This was originally posted online at the website for the Payson, Arizona Church of Christ (http://www.paysonchurchofchrist.com/) It was so fitting of what we wanted to say that we took the liberty of modifying it slightly to fit our church.